ISIS Declares Caliphate As Iraq Fights To Retake Tikrit : The Two-Way The plan was unveiled one day before the Iraqi parliament will hold its first meeting since the April 30 national elections. 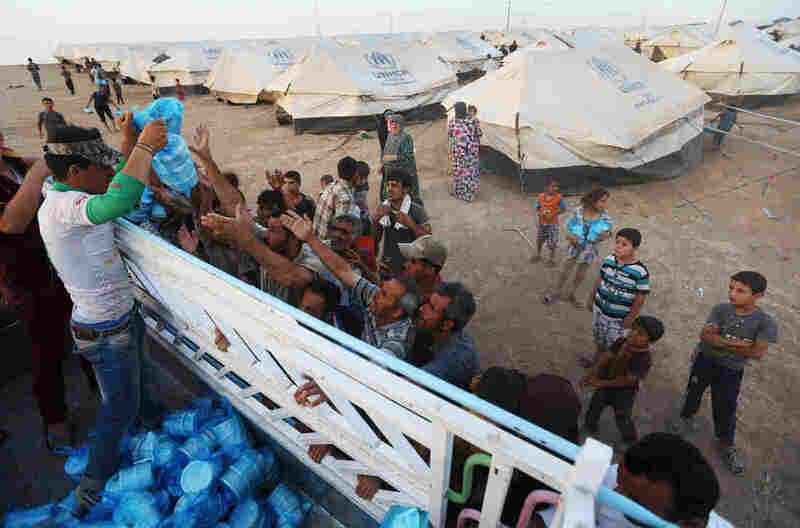 Displaced Iraqi citizens receive meals to break their Ramadan fast from a Kurdish charity group. Iraq's central government has launched its first major operation against the ISIS insurgent group. Extremist Sunni group ISIS has announced a plan to rule the territory it has carved out of Iraq and Syria in recent months, in a declaration that touches on public services, salaries and compensation for damages from the violence. The plan was unveiled as Iraq's central Shiite government tries to retake the city of Tikrit, in its first major operation against the insurgents. And it precedes by one day the Iraqi Parliament's first meeting since its April 30 elections; Prime Minister Nouri al-Maliki, who has been widely criticized during this crisis, has resisted calls to form a unity government that gives more involvement to Iraqi Sunnis and Kurds. "Backed by irregular Shiite militias, Iraq's army and special forces are fighting for control of Saddam Hussein's hometown, Tikrit. The Sunni-dominated population there is deeply hostile to the Shiite-led government, whom they say has marginalized them. And residents say local tribes are now ruling the town. "An Iraqi military spokesman said that forces were massing in the government-held town of Samarra, backed by newly arrived Russian jets, and would make another push from there for Tikrit soon." The statement ISIS released comes to us via NPR's Deborah Amos (translated by Hania Hansey). It reads, in part, "Salaries will be distributed in the liberated provinces next month, and employees working in all state institutions will receive, along with their salaries, Eid bonuses." It also includes several comments about protecting "state property" — referring to the new Islamic state. And it promises compensation for "any losses sustained as a result of random shelling by the Safavid army." Safavid, we'll note, was a Persian dynasty that ruled Iran and other areas from the 1500s to the 1700s, establishing Shiism as the state religion. The reference echoes accusations that Maliki is a puppet of Tehran (read more about the Sunni-Shiite split in our primer). In Shiite-led Iran, officials say they are willing to help Iraq fight what the country's supreme leader calls the "enemies of Islam" who are behind the violence. "During comments marking the beginning of the Muslim holy month of Ramadan, Ayatollah Ali Khamenei attacked the militants known as the Islamic State of Iraq and Syria as representing what he called 'American-style Islam' and using 'the appearance of Islam' to carry out the bidding of unnamed foreign intelligence agencies. "Separately, an Iranian general Sunday said just like in Syria, Iran is prepared to send military aid to the government in Baghdad. Analysts say Iranian equipment and advisers have already been sent to Iraq, while a shipment of Russian fighter jets arrived in Baghdad over the weekend. "Iran is a strong backer of Shiite control in Iraq, although Iranian leaders have remained relatively quiet on the job being done by the controversial Prime Minister Maliki."